The term "rat", as commonly used, has no defined biological meaning. A "rat" is simply any rodent that looks at least somewhat like a mouse, but is larger. Animals fitting this description have evolved multiple times, so that rats do not form a single evolutionary group, and not all of them are even members of the mouse family. 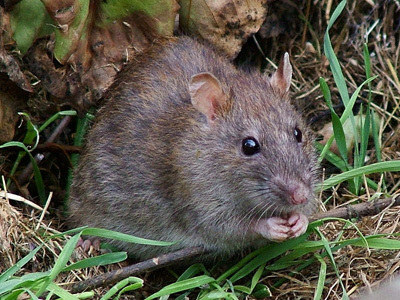 Nonetheless, there is a biological group that we can call, for lack of a better term, the "true rats" (technically the "Rattini") which includes the animals that most people likely think of when the term "rat" is used with qualification. There are two species of this kind of animal in Britain, not least because both of them are found just about everywhere else as well. Being a small mammal (or, indeed, any other kind of animal) can be tough; there's always something out there that wants to try and eat you. There are a whole host of adaptations that animals use to try and avoid this fate. Running fast and being good at hiding or camouflage are, perhaps, the most obvious and widespread defensive methods. Another approach is to live somewhere that it's really difficult for most predators to find you, such as spending your entire life in an underground burrow. Fighting back, as larger horned animals might do, generally isn't so effective, although skunks (for example) have certainly found a way of doing that. But there is also the option of body armour. It's something we see quite a lot in reptiles and, in living mammals, it's perhaps best developed in armadillos. But body armour doesn't have to be a bony or keratinous shell, for something that wants to avoid being eaten, spines can also be an effective deterrent. This is the post that will be current as of 1st April, when Synapsida traditionally hands over to the Lords of Misrule. Or, failing that, birds. The fossil history of birds is less well-studied than that of mammals. This is hardly to say that it has been ignored, and we do know a reasonable amount about it. But a key problem with bird fossils is that, in order to fly, birds have light and fragile bones. 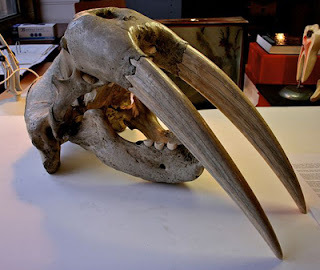 These don't tend to survive the fossilisation process intact (bats don't do much better) and birds also lack the great standby of palaeontologists specialising in mammals - teeth. 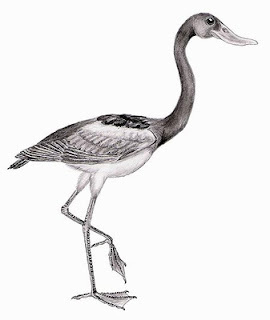 Of course, a notable exception to this are the flightless birds, which can be enormous, and tend to have reasonably solid bones even when they aren't. It's a lot easier to find a reasonably intact skeleton of a terror bird, or even a penguin or fossil ostrich, than it is of something that flies. There's a reason that the previous posts in this April series have all focussed on the flightless sort. But most birds do fly and are, let's be honest, well known for it. And, despite the difficulties, we do have a number of fossils of flying birds of various kinds - all the way back to Archaeopteryx - so that their evolutionary history is very far from being a blank book. The smallest species of mouse native to Britain, and, indeed, one of the smallest species of mice anywhere in the world, is the harvest mouse (Micromys minutus). 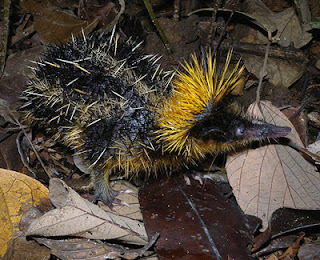 With a typical adult weight of around 7 grams (0.25 oz.) or so, it's only around a quarter of the weight of a typical house mouse, and is known by terms translating as "dwarf mouse" in a number of European languages, including both German and Greek. 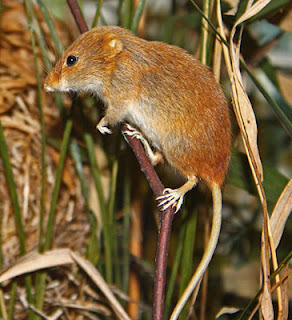 Harvest mice are widespread, being found across much of Europe, and in a band across Asia that reaches as far as Japan and Taiwan in the east. A 2009 study from Vietnam suggested that the harvest mice there might be a separate species, but it was small scale and not yet fully accepted. Certainly, it's an unusually hot climate for harvest mice which, in Europe, are found only in northern Spain and Italy, only sporadically in Greece, and not in Portugal at all. On the other hand, while they are reasonably common in central and southern Finland and southern Scotland, they are rare in Sweden and absent from Norway. (They also don't reach Ireland, but the sea is the likely barrier there, rather than the climate). Seals have a moderately long fossil history, with some of the oldest examples dating from Europe, around 15 million years ago. Although they are now found worldwide, back in those early times, they seem only to have lived in the North Atlantic, reaching the Pacific only around 11 million years ago (probably by the simple expedient of swimming through the seas that then covered what is now Central America). 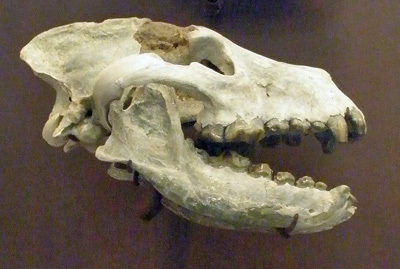 However, one of the world's best fossil sites for recovering fossil aquatic mammals is at Sharktooth Hill, just outside of Bakersfield, California. Part of the larger Temblor Formation, the deposits here consist of silts and sands, laid down just over 15 million years ago, when California was sweltering in the Middle Miocene Climatic Optimum, a time of unusually high worldwide temperatures - and correspondingly high sea levels. This was before seals had reached so far west, but that does not mean that a number of similar animals did not already live there at the time. Although the actual number may be higher, depending on the status of certain subspecies, there are 38 widely recognised species of wild cat. 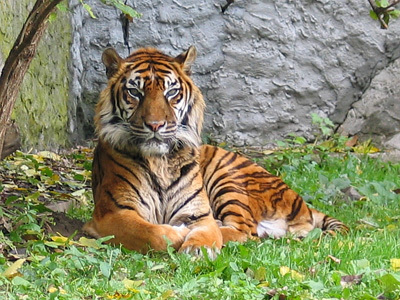 Of these, five are formally considered to be "endangered species", and a further thirteen are "threatened", but not sufficiently so to fall into the riskier bracket. Taken together, that's almost half of the total species, and it ignores the significant number of species that are threatened in parts of their natural range, but survive well enough somewhere else. The primary reasons for this are habitat loss and poaching, and virtually every species of cat - even those, such as the puma/cougar/mountain lion, that aren't threatened overall - has a declining population. Fortunately, the same thing that makes wild cats attractive to poachers - their undeniable charisma and beauty - also inspires conservation efforts of the sort that, say, the Ethiopian amphibious rat (Nilopegamys plumbeus) could only dream of.